I finally read the second volume in IDW/Eurocomics brilliant reprinting of the Sinner series by José Muñoz and Carlos Sampayo. It was was published about a year ago, but I somehow missed it. 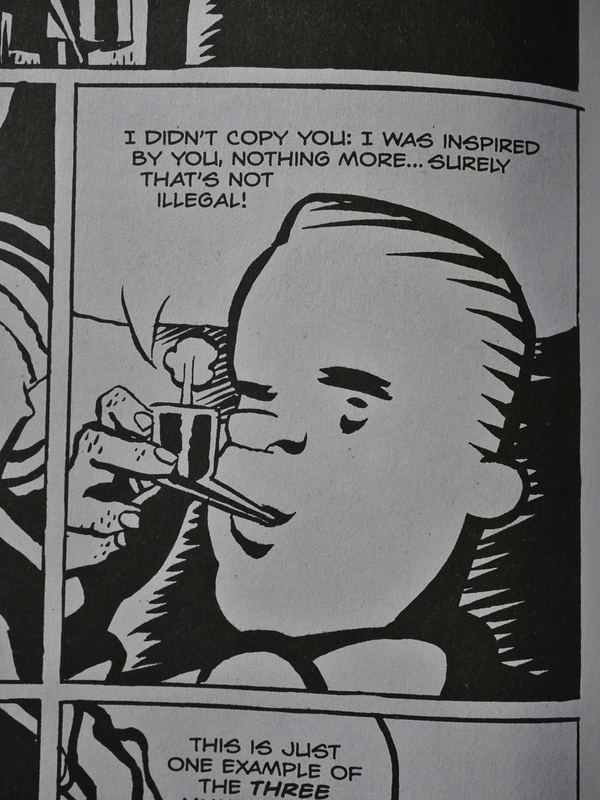 One of the shorter pieces in the book, Over Some Drawings, seems to call out for more attention than it got. I thought surely the twitters and the blogs had to be all er atwitter about this story, but I googled and the only mention I could find was on a Swedish language blog. … and break his hands. This is interesting beyond the story itself because the plagiarism thing is true: A super-hero comic book artist called Keith Giffen spent several years in the 80s bewildering his fans by drawing in an exiting, fresh style that seemed to come out of nowhere. 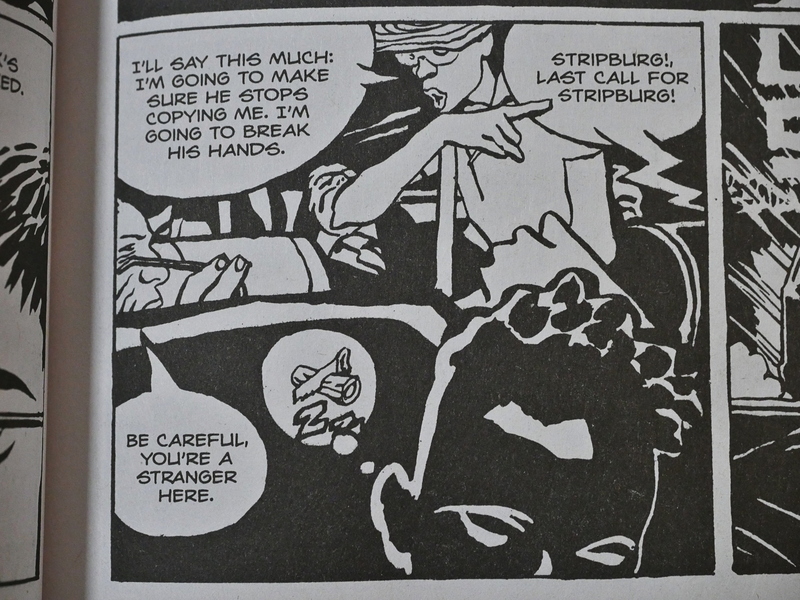 And then The Comics Journal did an exposé and demonstrated that Giffen’s panels were swipes, line by line, from José Muñoz’ panels. 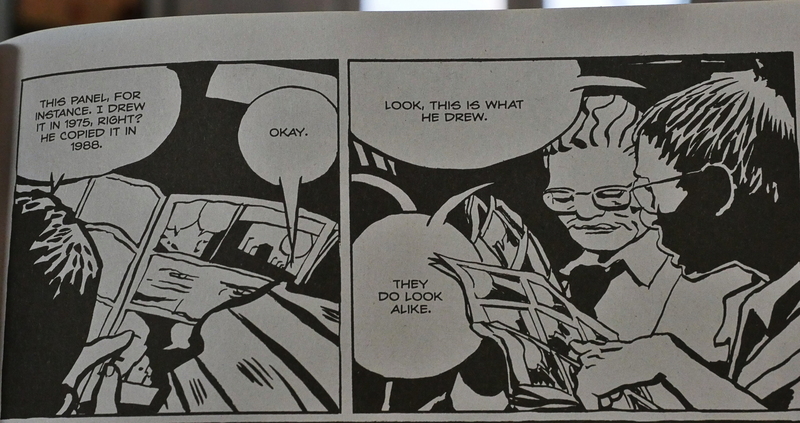 In this story, Muñoz’ analogue José Martinez confronts the American comic book artist, here called K. K. Kitten. 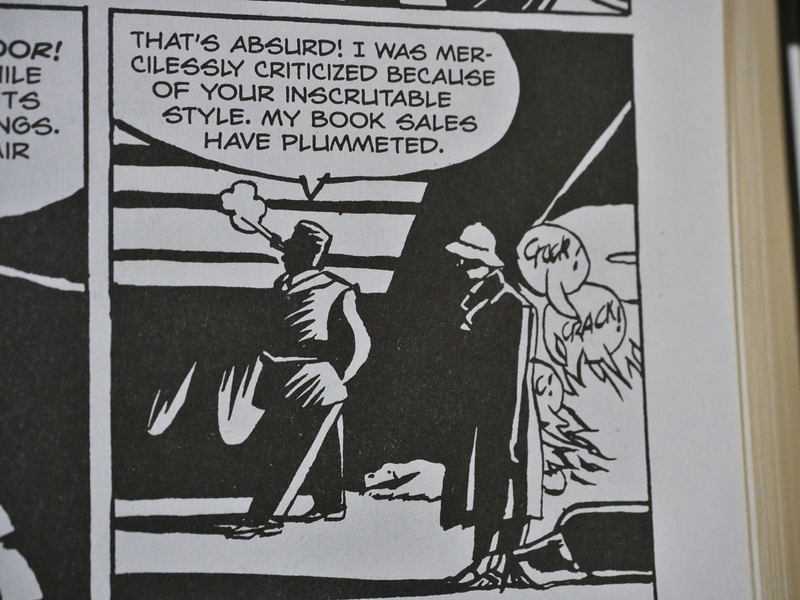 … and then absolutely refuses to apologise because swiping Muñoz’ style was a commercial mistake. The story has two endings: In Alack Sinner’s dream, Martinez seems to kill Kitten, or at least beat him up bad. 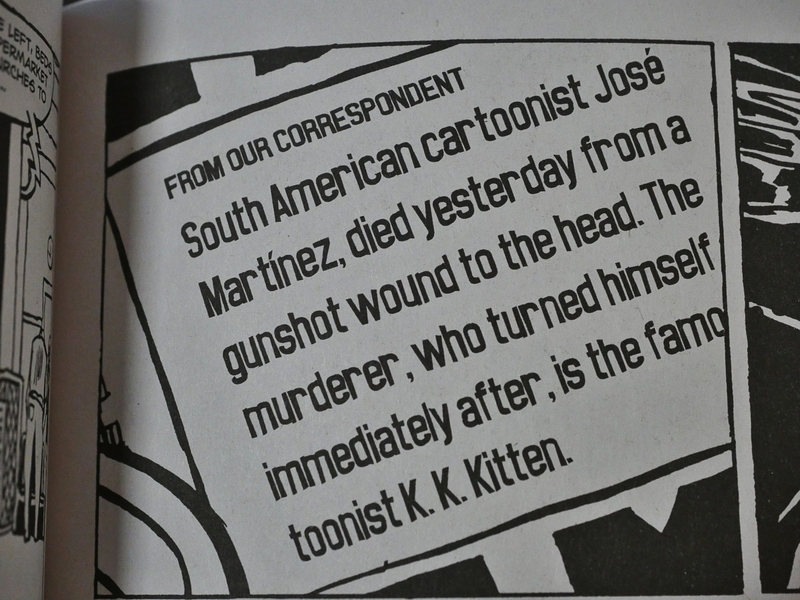 In reality, as Sinner finds out from a newspaper, Kitten killed Martinez. It’s hard to tell from this story whether Sampayo/Muñoz are just goofing around, or whether Martinez’ feelings are representative of their own feeling on the issue. The “real” ending seems to suggest the latter, I think, but the depiction of Kitten as living in a mansion and smoking a pipe seems to suggest the former. Perhaps nobody’s talking about this because nobody bought the book? It’s a great book: Some of the mid-period Sinner stories dissolve into confusion, but this volume has two very well-made and satisfying classic noir stories. 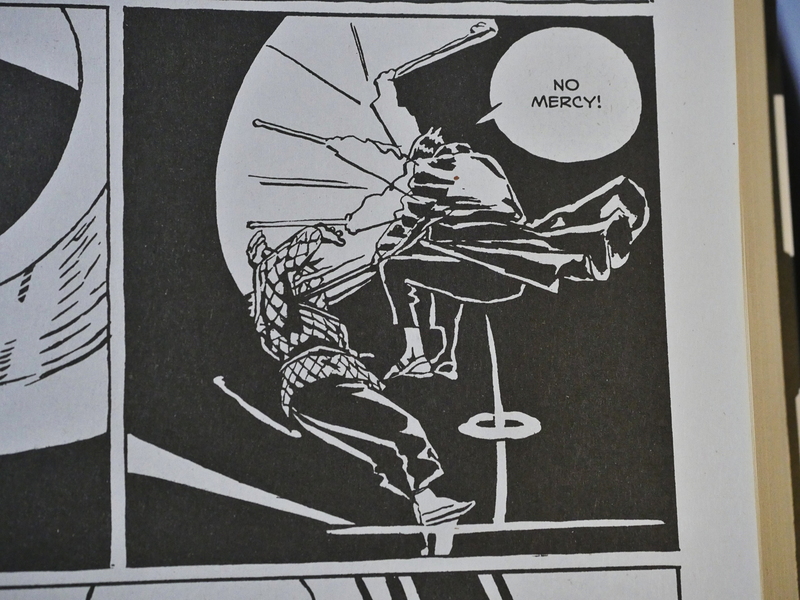 And Muñoz artwork, as always, is just transcendent. I give it all thumbs up: One of the best collections of comics released last year.